Hidden away in the rocky alcoves beneath craggy overhangs and weathered sandstone monoliths are a series of sacred paintings depicting the life of the Yiithuwarra people who lived on the islands of the Flinders Group near Cape Melville, north of Cooktown. The Yiithuwarra people are now vanished from their ancestral home, removed during WWII along with dozens of other neighbouring tribes and clans to the 'safety' of Christian missions like Hope Vale and Wujal Wujal. The authorities feared the welcoming Aborigines, by now accustomed to visiting seafarers, would lead an invading Japanese force to water and food sources. Societal structures and families were further disintegrated as men went off to work on stations and ships and the women into domestic service. Today we are visiting one of these sacred sites on Stanley Island with Danny Gordon, a guide and interpreter for the Yiithuwarra people who is travelling with Oceanic Discoverer as she makes her journey from Cairns to Thursday Island. Of all my travels around the coast of this country, I realise this is one of the very few times I have ever had a traditional owner show me their land and its significance. Sadly, expert and sensitive guides like Danny are rare. European guides, although expert and learned, cannot impart the deep the cultural importance that only comes with thousands of years of connection with a place. Danny has been a guide for over twenty years, working with Captain Cook Cruises and Clipper Odyssey in the past and just Coral Princess Cruises and Orion Expeditions currently. His brother Willie from Cooktown is one of the best known Aboriginal tour operators in the country and both Danny and Willie are currently training younger family members to eventually take their place. Australians travel around the world to experience exotic cultures and civilisations yet one of the planet's oldest and mysterious is right here on our doorstep. Sadly, generations of marginalisation by the now dominant European culture has muted our appreciation for these hardy and ancient people. 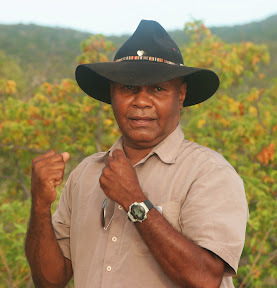 Ian Morris, another guest lecturer aboard Oceanic Discoverer, has lived most of his life with the indigenous people of northen Australia and is an environmental consultant to academia and government. Ian believes that Australians are travelling more to seek a connection with the indigenous Australian culture to fill gaps in their understanding and correct much of the accumulated misundertsanding.